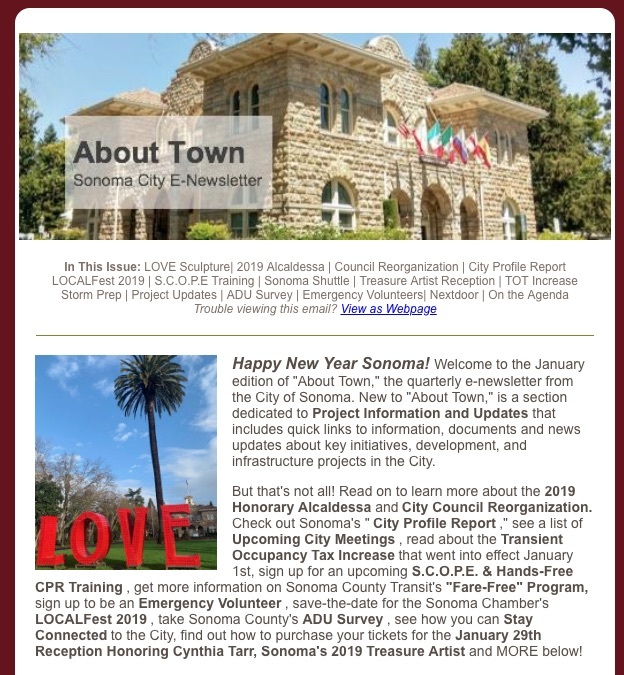 The latest edition of “About Town,” the quarterly E-Newsletter from the City of Sonoma is now available. Click here to view online to read about the 2019 Honorary Alcaldessa and City Council Reorganization. Check out Sonoma’s “City Profile Report,” see a list of Upcoming City Meetings, read about the Transient Occupancy Tax Increase that went into effect January 1st, sign up for an upcoming S.C.O.P.E. & Hands-Free CPR Training, get more information on Sonoma County Transit’s “Fare-Free” Program, sign up to be an Emergency Volunteer, save-the-date for the Sonoma Chamber’s LOCALFest 2019, take Sonoma County’s ADU Survey, see how you can Stay Connected to the City, find out how to purchase your tickets for the January 29th Reception Honoring Cynthia Tarr, Sonoma’s 2019 Treasure Artist and much more. If you didn’t see this edition in your inbox, Sign Up to receive future e-newsletters from the City of Sonoma today!